Whether you are an experienced user or entirely new to Summit, you are invited to the following Summit Training Sessions for Finance Users. This training will focus on access to the Finance System dashboards that support department administrators, managers, and PIs. Over the weekend SUMMIT dashboards for Finance and HR Directwas upgraded to version 11G and is now available. This upgrade is mostly technical in nature however you will notice a few changes to prompts, navigation and general formatting. This upgrade puts us in a position to utilize new technology and featuresenabling us to roll out enhancements in the near future. Below is important information you should be aware of regarding the upgrade. 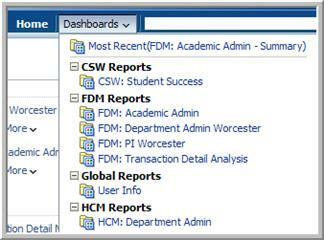 A list of your available dashboards will appear, click on the dashboard you would like to access, note Finance dashboards are listed under FDM Reports and HR dashboards are listed under HCM Reports. ‘ Filters ‘ now include the ability to access a search function to find criteria based upon text entered. Clicking the More/Search’ Box will open a pop-up window which allows you to search for the criteria. ‘ Apply Button ‘ this button replaces the ‘GO’ button, use this button to retrieve your data. ‘ Reset Button ‘ this button replaces the ‘Clear Filter’ button, use this button to clear your filter criteria. ‘ Return to Summary link ‘ this now appears as a link rather than a button and can be found at the top and bottom of most Activity pages. ‘ Export Link – replaces the Download/Print option on individual widgets, accessing this link will give you the option to download to PDF, Excel, PowerPoint, Web, or to download data only. 4/12/13 Summit Upgrade has begun and…. As planned, the Summit system is now unavailable for finance and human resource dashboard reporting. The Summit system is being upgraded to version 11g of Oracle’s enterprise reporting / business intelligence software.The project team began the upgrade process starting at 5:30pm Fridayand expectto release the updatedsystem for all users byTuesday afternoon. More information will be posted on http://empac.uml.edu as the new system becomes available. Summit Fundamentals Quick Reference Guide_v11g.doc. The go-live date for the new version of SUMMIT is scheduled for Tuesday, April16th SUMMIT will be unavailable beginning Friday April12that 5:30pm until mid-day on Tuesday April 16th. We will notify users as soon as SUMMIT is available. Please note: Saved filters or prompts you currently use in SUMMIT will not be available in the upgraded version. You will be able to recreate your prompts once the system is available, therefore you may want to make note of your saved filters and prompts before the system becomes unavailable on Friday April 12th at 5:30pm.